Every year, it seems, I have an unexpected plant growing in my garden. I'm always intrigued as to how it got there and what exactly it is. 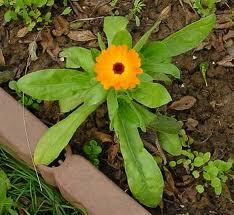 At first I thought they might be calendula, since we actually sowed some of them last year. It would make sense that they would reseed themselves. My gardening neighbours suggested they might be bachelor buttons. Apparently they're everywhere in the garden plots this spring. They're also self-seeding so it wouldn't be a big surprise to see them being distributed from one garden plot to the other by the cultivator or by wind. Whether they're calendula or bachelor buttons, as I now suspect, do I let them grow or do I treat them like a weed? Are they sucking precious nutrients and water from the soil? Are they attracting pests that will harm my precious veggies? Are they an unpleasant nuisance hindering the growth of more "superior" plants? No. In fact, they're pretty, attract beneficial insects to the garden, and make great cut flowers. The main concentration is growing in my squash patch, which is bare right now and will be for some time until the squash takes over. I'd rather have them growing there than more ferocious weeds like thistles or quack grass. Looks like I'll have some lovely flowers growing in my garden this summer - whether they're orange calendula or blue bachelor buttons. Thanks WolfSong. It's great to hear from you again, how's your gardening this year? Trying anything new? My other new thing is white tomatoes. I saw the seeds on Baker Creek, and just had to try them. Now, if only the rain would stop long enough for me to get them in the ground! Great idea re the leeks! I start mine from seeds. They're so little when they I set them out it's hard to separate them. But, on the other hand one seed packet goes a long long way. Can you believe the amazing variety of tomatoes out there?! I've got black and purple ones.